To move the head restraint downwards, press and hold the safety button » Fig. 59 - B with one hand and push the head restraint down with the other hand. Press the locking button in the direction of the arrow » Fig. 59 - B and pull the head restraint out. To re-insert the head restraint, push it far enough down into the seat backrest until the locking button clicks into place. Best protection is achieved if the top edge of the head restraint is at the same level as the upper part of your head. Correctly adjusted head restraints together with the seat belts offer effective protection for the occupants » page 7. Never drive with the head restraints removed - there is a risk of injury. If the rear seats are occupied, the rear head restraint must not be in the lower position. 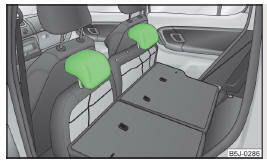 The rear head restraints can be inserted into the corresponding holes in the folded seat squabs » Fig. 60.